If you enjoyed the original Fluffy Favourites slot, then you will love Fluffy Favourite Mega Jackpot. This 5, reel, 25 payline slot is adorable. It features all of the same cute fluffy stuffed toys including the cuddly hippo and giraffe. Fluffy Favourites Mega Jackpot is different to Fluffy Favourites as it is full of exciting jackpots meaning bigger prizes are up for grabs. 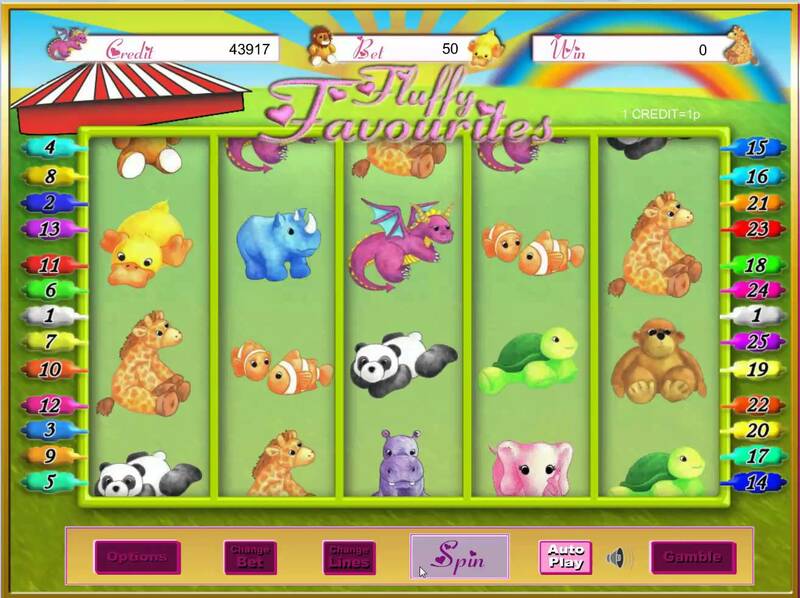 Experience lots of funfair fun with this slot. There are many rewarding features which include a toybox pick, a gamble bonus and lots of jackpots. Fluffy Favourites Mega Jackpot is the thrilling sequel to the well-loved Fluffy Favourites slot. Have all the fun of the fair in this exciting 5 reel, 25 payline slot. You'll have a chance to play lots of great funfair games to win fabulous prizes. The reels are placed on top of a bright green grassy hill. It's the perfect day to enjoy the fair as the sun is shining brightly and a beautiful rainbow glows in the sky. A circus tent can be seen on the left which is waiting to be filled with happy and excited faces. The symbols include various cuddly toys including a rhino, lion, panda, duck, fish, elephant, turtle and dragon. The Wild Symbol - The wild symbol in this slot is the adorable pink elephant. This substitutes all other symbols on the real except the scatter. Landing 3, 4 or 5 elephant wilds will grant 15, 20 or 25 free games. The Scatter Symbol - The scatter symbol is the claw. Landing 3 or more claw scatters will activate the toybox pick. The Toybox Pick - Use the claw to select your favourite cuddly toy. If you pick a good one, your winnings could increase by 100x. Gamble Bonus - When a win occurs, you have the chance to gamble your winnings. If you choose to gamble and luck is on your side then your winnings will be doubled. If the gamble does not pay off, your winnings will be lost. Jackpots - The 2 jackpots are randomly activated throughout the game which gives you a great chance of winning big. If you love the Fluffy Favourites series then you will enjoy Fluffy Favourites Mega Jackpot. This slot is very fun with its funfair theme and the graphics are great. You can experience all the fun of the fair with Fluffy Favourites Mega Jackpot without having to leave your house. There are so many fantastic opportunities to win with this slot, especially with the toybox pick feature where you can win 100x your stake.